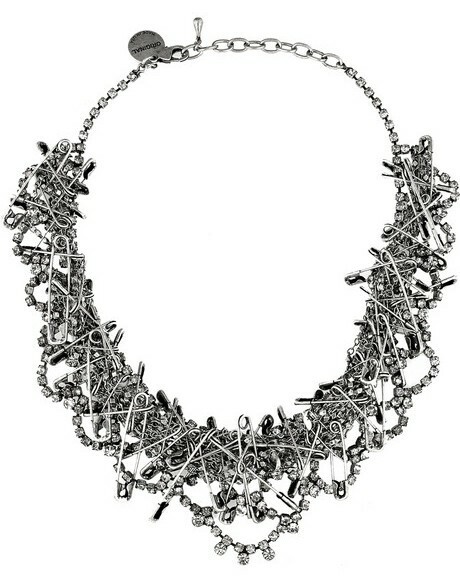 Like many others, I’m entranced by Tom Binn’s jewellery which fuses a punk aesthetic with high couture for a unique finish. Fab, right? But it costs over 600 pounds!! 2. 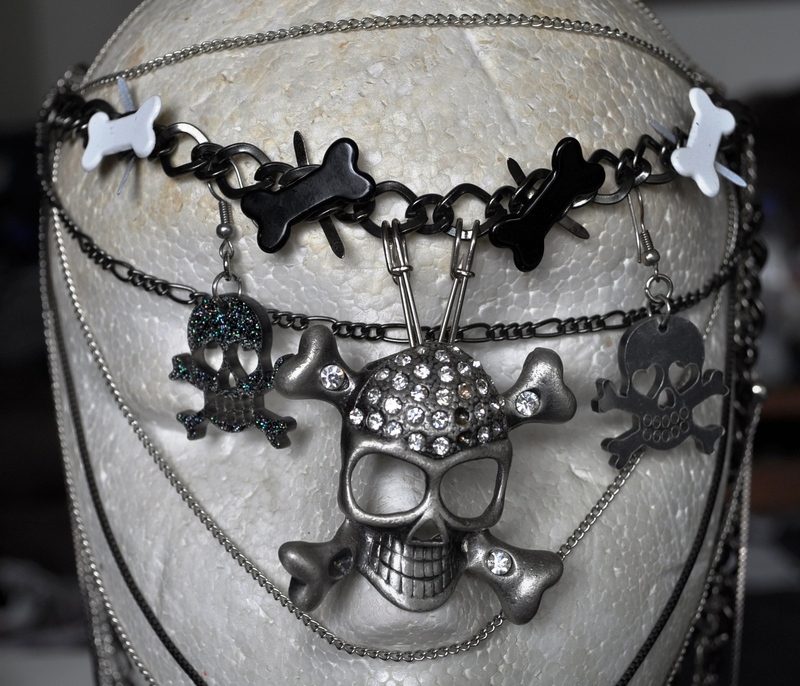 Skulls, beads, charms, chains, maybe little bones…and safety pins! Raid your jewellery drawer and craft cupboard – you never know what you’ll find. 1. 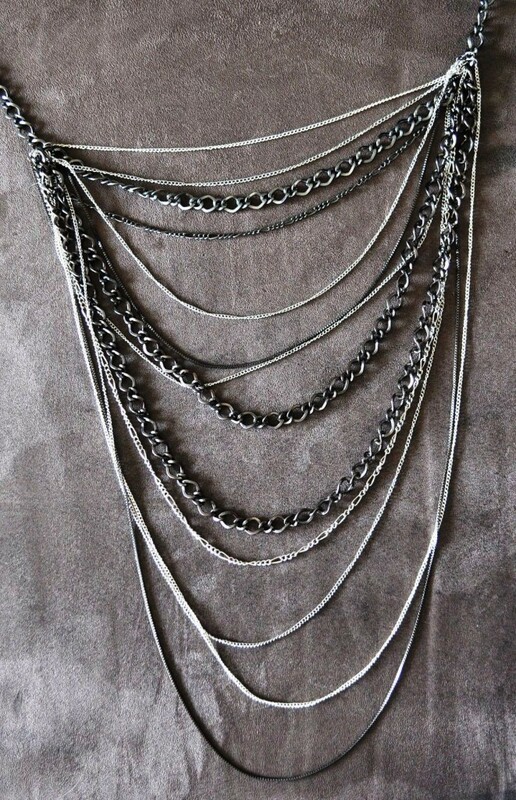 Have a good look at your chain and work out where to put your various elements. 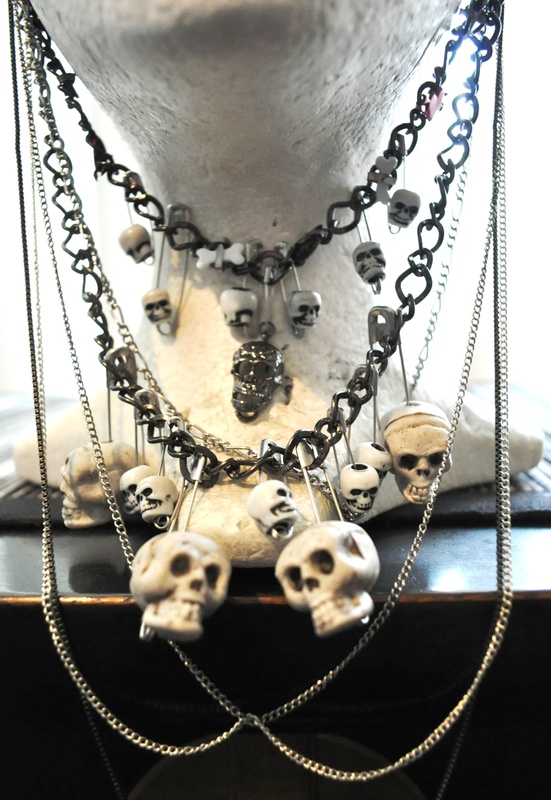 I decided to only use the chunkier chains in my necklace for the bulky skull beads etc. 2. 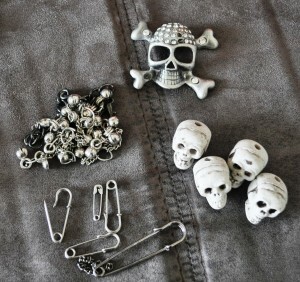 Start placing the beads and charms, attaching by means of safety pins or existing link chains, and take off again if they don’t work. 3. At a certain point you’ll need to affix your chain necklace to something that will keep it steady while you add more beads, chains etc…Otherwise the little beads may end up on the wrong side when being worn. I discovered this was happening with my little bones especially. 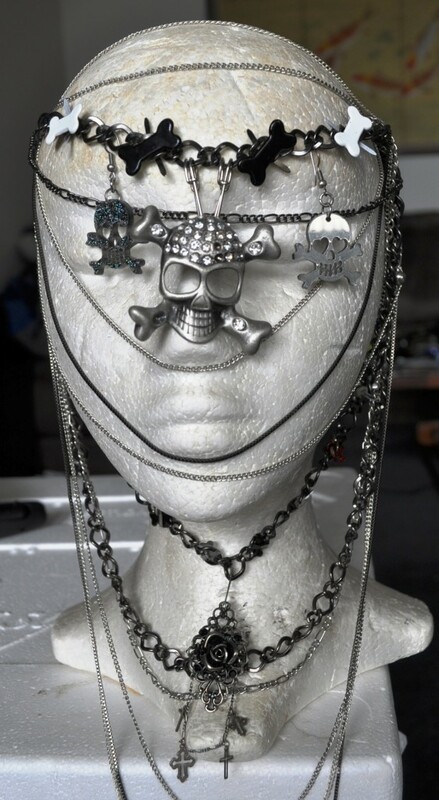 I used a foam mannequin head and stuck pins through a couple of the chain loops at the back to hold it firm. 4. Keep going, adding and subtracting elements as you see fit. 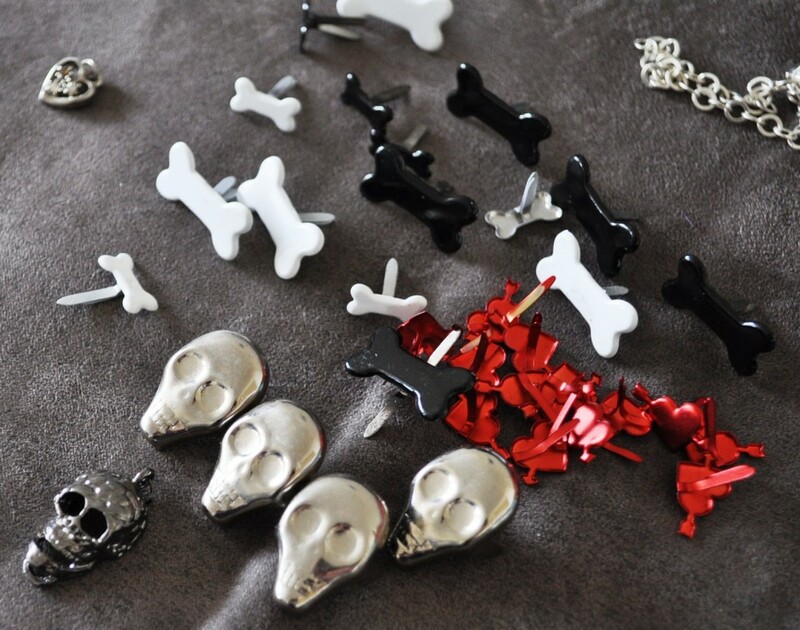 In my case, I took off the skull earrings as I felt they looked a bit tacky, and added more skull beads in various sizes instead…and more safety pins! (I had to rush up to the dollar shop for more, heh). 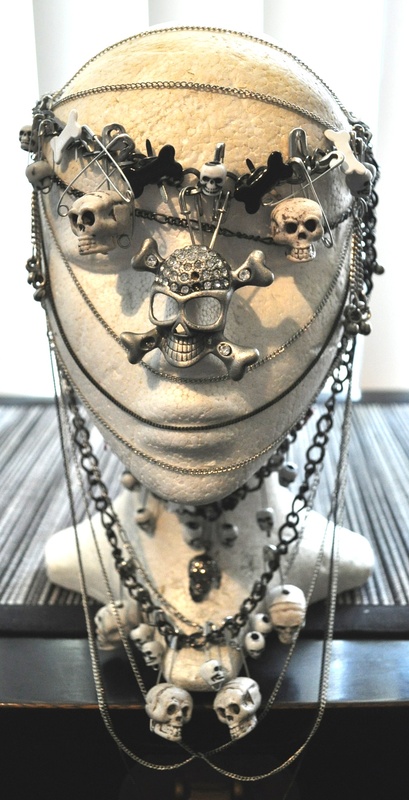 There are lots of other exciting things you can do with safety pins and chains – why not pick your fave designer and attempt a DIY? This blog Brook & Lyn took a Moschino jacket and copied it using lots of tiny gold safety pins around the collar. 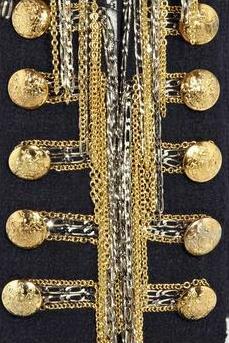 For myself, I’m eyeing off Balmain’s latest military jackets that have chains adorning each buttonhole and frogging, and the dress completely covered in fine gold chain. Hmm, gonna need a whole lotta chain…..
Have you DIY’d anything with safety pins? What would you like to make, if you did? So, it’s August! Last month of Winter for us aussies & Spring is right around the corner – yeah! 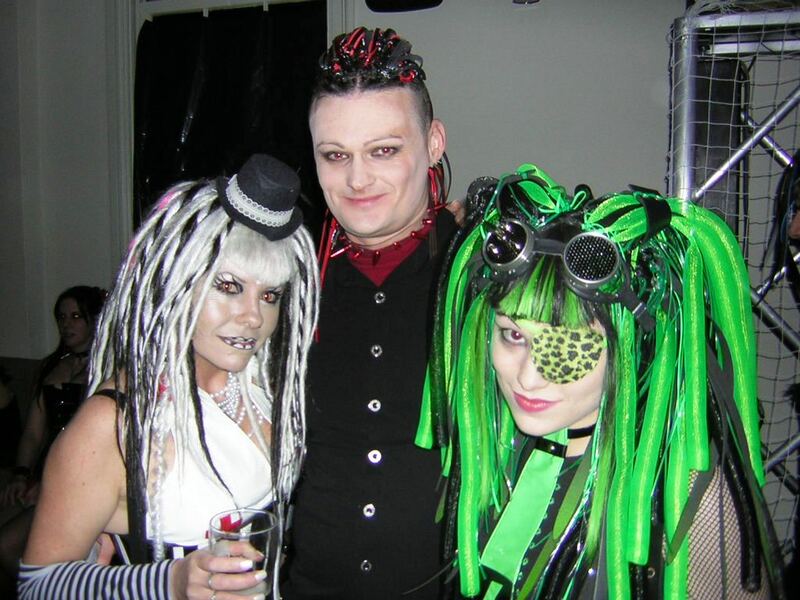 I just wanted to say hello to all the new alternative, goth & psychobilly chicky babes who’ve started following TFT recently – Welcome! Right, let’s get onto it, shall we? I bought one that has little ringlets, as I’d gone all Pride & Prejudice for a fancy dress party. 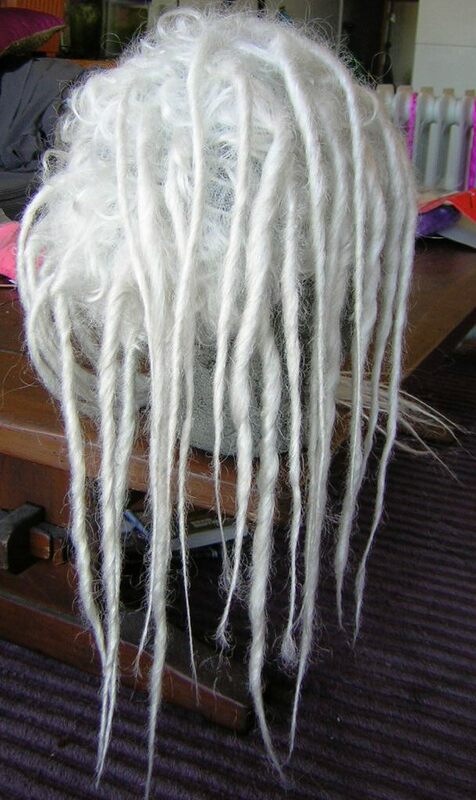 Ones with curls can be better than straight ones, as they’ll matt up nicely later when you go to “dread” them. If you have a foam head to put the wig on, do so now. Untwist the curls a bit and make lots of small sections. Start to backcomb the hair in each section. 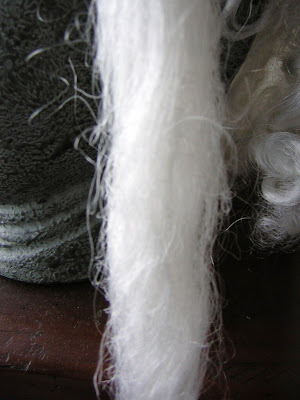 See the thickness of my sections – you want relatively thick sections as they’ll shrink a lot later when you steam them. As you backcomb each section, twist it as well, pulling hard with your fingers to make the fibres twist the same way. – if you have a proper steamer, of course use that! 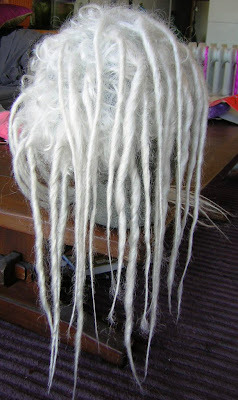 Pay particular attention to the ends of each dread, so that they taper nicely and are sealed off (again, dunking in boiling water is good). 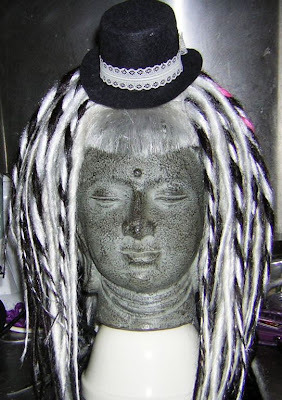 You WILL find the dreads shrink, so you end up with a wig that looks like it has a lot less hair than when you started (see pics above). 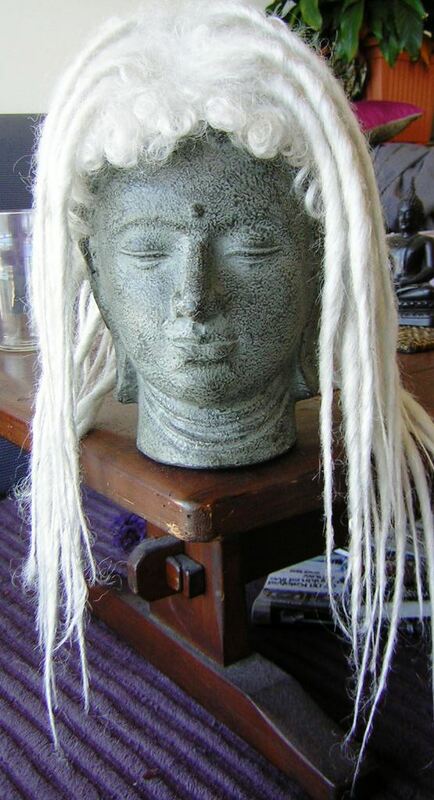 After each one is done, let the wig dry. At this point it all looks a bit scraggy, so lots of filling in is needed. 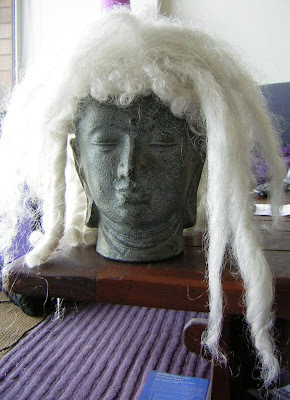 I made a bunch of dreads out of kanekalon (not very well, may I add – my forte was roving dreads). 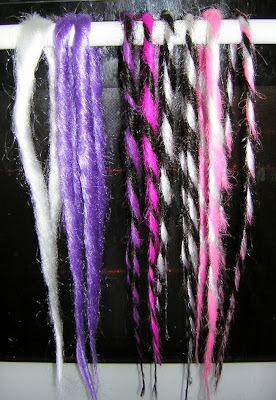 So either make some as I did, or if you have dreads lying around from falls or whatever, start adding them to the gaps. 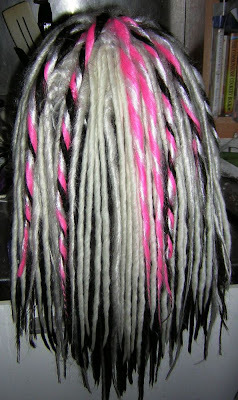 If you look closely, you’ll see that I also added quite a few “dreads” that were in fact chunky strands of wool. 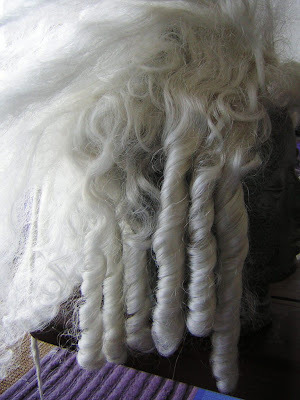 You could use colinette, but in Australia here we have a wool that is very chunky and approximates a dread, so I used that. Sew each one in, or you could plait to the base of existing dreads on the wig. I went for an edgy look that has black underneath, so it just peaks out from under the white dreads on top. 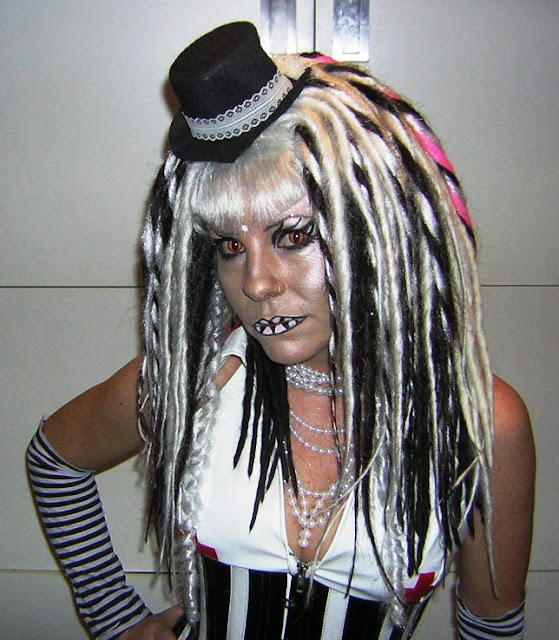 You may have long tresses instead of a fringe, which can be left how they are (depending on your wig). 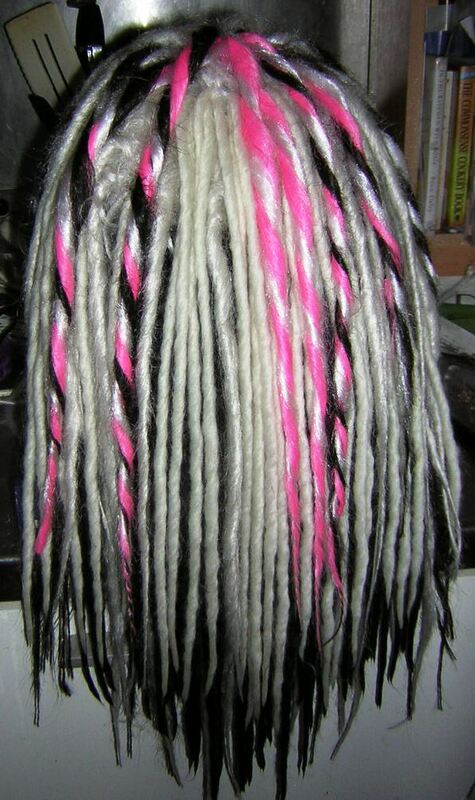 The fringe on mine was incredibly curly. If yours is too, just get your straightening iron out and straighten the fringe/bangs.Then trim it to suit – I did a nice ‘V’ shape. You may prefer to leave yours blunt across, or in a nice curve. Don’t make it too short! I saw this picture in a magazine, and decided I wanted to DIY something similar. I really liked the way the black additional piece buckled over the white shoe, to make it something more creative (although I suspect it was attached to the leggings). 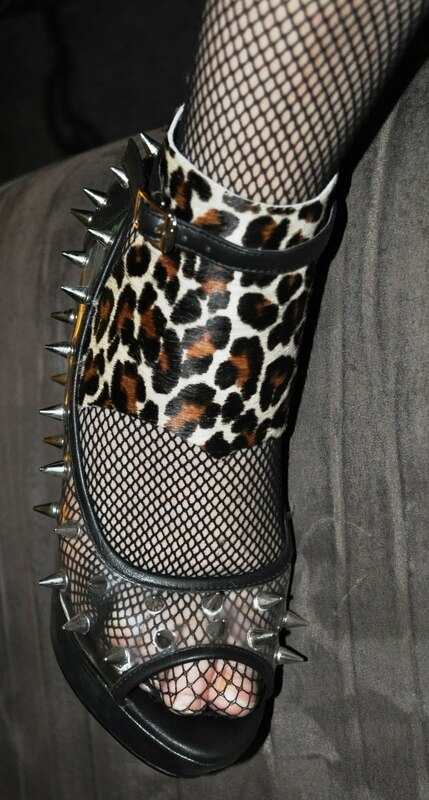 It’s not exactly a spat, because spats cover the whole foot, so I’ve called my invention “strappy spats” instead. 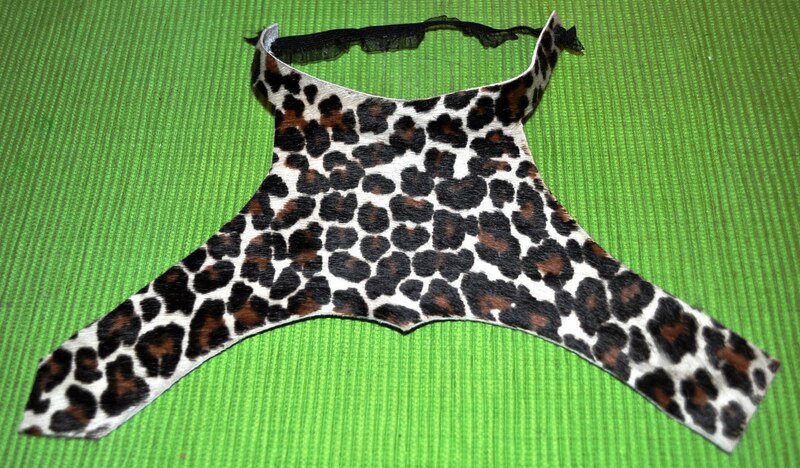 I decided I’d do my own version – but in leopard print! 1. I got a piece of paper and started copying the basic shape. Then I started cutting it out (as you can see, above). 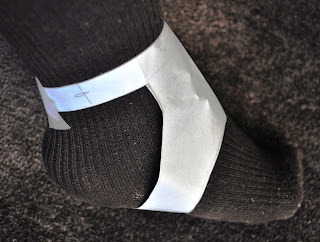 I cut 2 pieces of the shape and sticky-taped them together in the middle – this way, I could adjust the pieces when on my foot to get a better fit. 2. Then I tried the shape on, to see how it fit my foot. Where it was a bit big, I’d overlap the pieces of paper and tape them. If the ankle straps or the under the foot flaps aren’t in the right position, amend them or get new bits of paper and change the shape/angle. 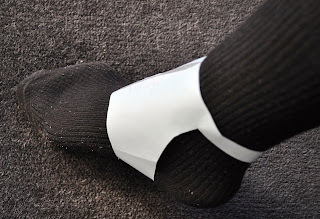 I eventually made the straps from a separate piece of paper to get the angle right on my ankle. You’ll get the best fit if you keep making little snips here and there, and taping to fit your foot as you go. You may have to undo the tape at one ‘seam’ to get it off your foot again, so use tape that can unstick easily. 3. When I was satisfied my paper template was pretty much correct, I grabbed my material. 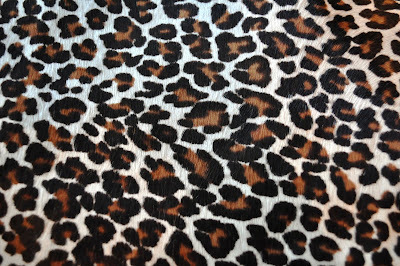 Cue my gorgeous leopard print cowhide! I got mine in Tokyo, where at Okadaya and Tokyu Hands you can easily get leather goods. In Sydney you can go to Birdsall Leather & Craft, or google for one in your city. 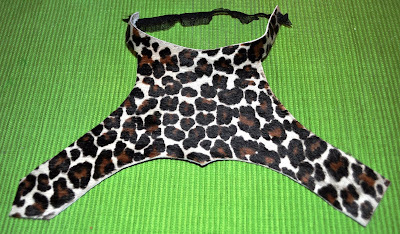 If you’re vegan or prefer not to wear leather, then PVC or vinyl is for you – try material shops. 4. Having taken the paper template off my foot (snipping it down the back to get it off), I flattened it out, placed it on the leather and traced around it. 5. I then turned the template over and traced one for the other foot. 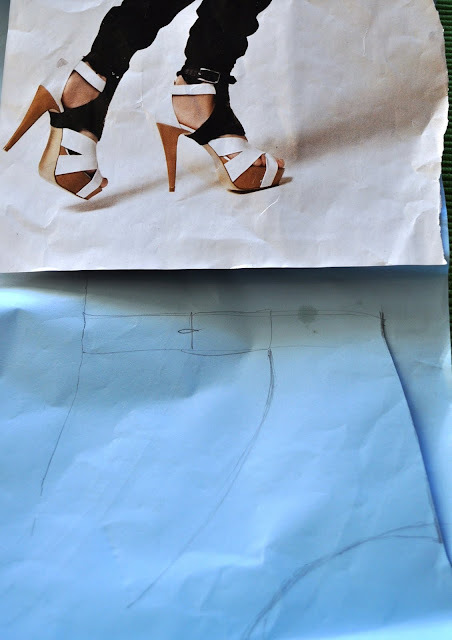 The template isn’t totally symmetrical, because your foot isn’t – hence the need for a mirror image. 6. Then it’s time to cut them out. 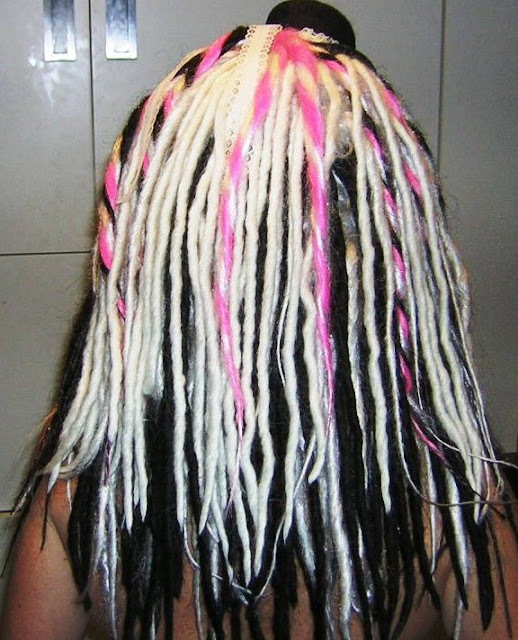 You end up with something like this. 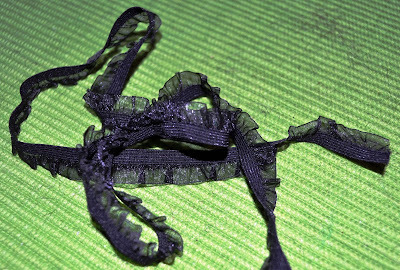 Except that in this picture I’ve already put the laces in. 8. 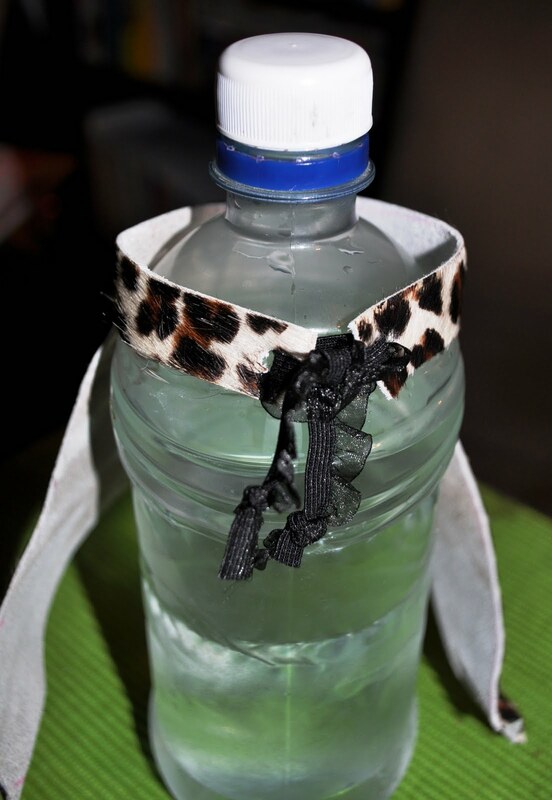 Then I just tied the ends round my ankle like this (as modelled by my lovely water bottle, heh). 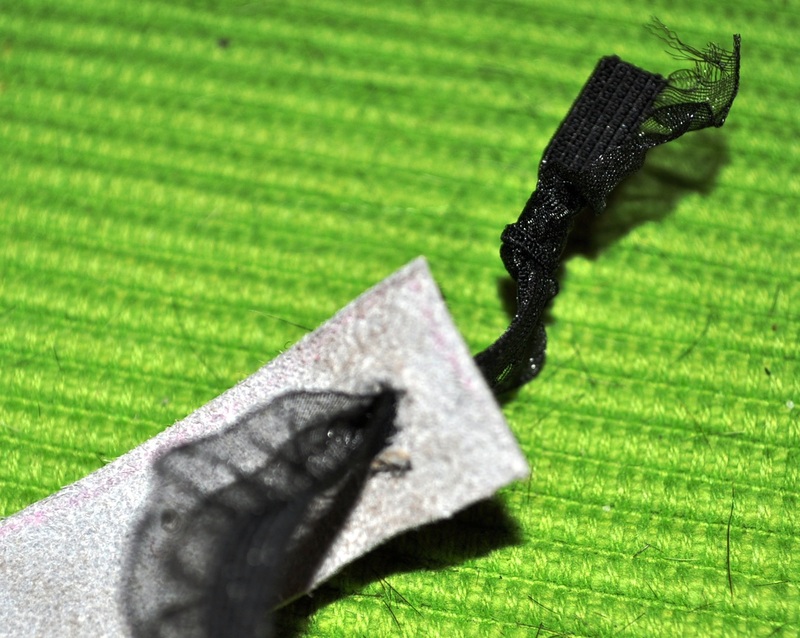 You can tie it into a bow to make it prettier, and tying a knot at each end stops the laces from coming through the holes once they’re threaded. 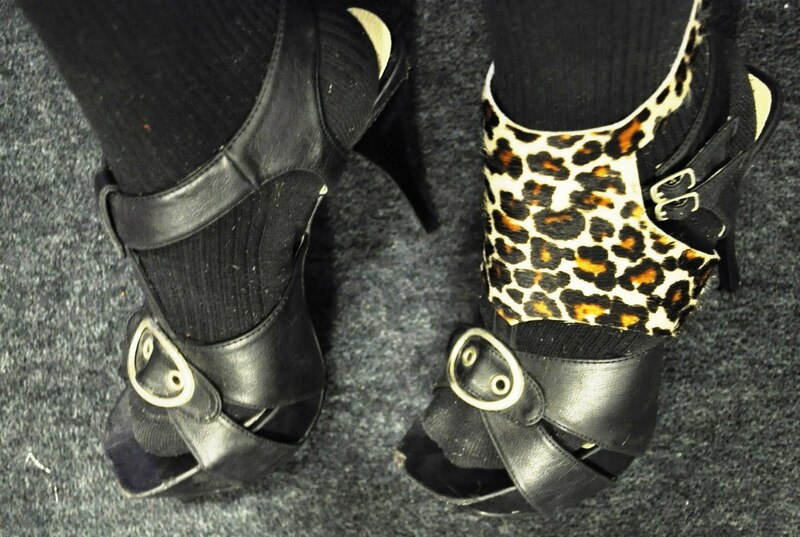 Then, I tried them out with a variety of my shoes to see which looked best! Check the instep and the outstep to see if it looks OK.
One with; one without. See how the strappy spat jazzes up the shoe? Under or over the straps can work equally well. 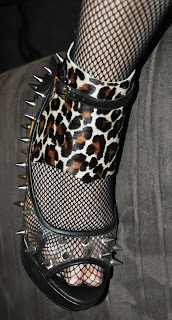 How about on my spiky wedges, or EGL crown shoes? See? Fashion forward or what? 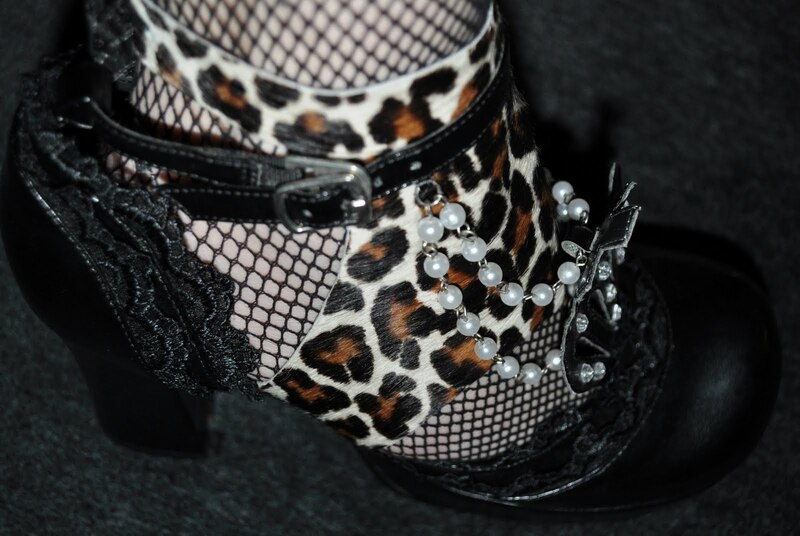 I’m next going to make some little leopard clip ons for the front of the shoes, to tie it all in and make the design more coherent. 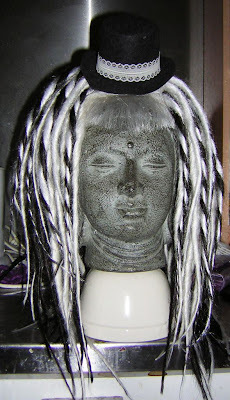 Anyway, as I run off and try some more DIY ideas out, won’t you give this one a try? And if you like it, be sure to tweet, StumbleUpon, show some Bloglovin’ or whatever. Thanks!! What’s that in your mail? Some nails!! Just a quickie to go SQUEEEEE!!!!! over a lovely gift I received in the mail yesterday (apologies for bad B 52’s pun in the title). A lot of readers will have already guessed they are from the fabulous Violet Lebeaux. 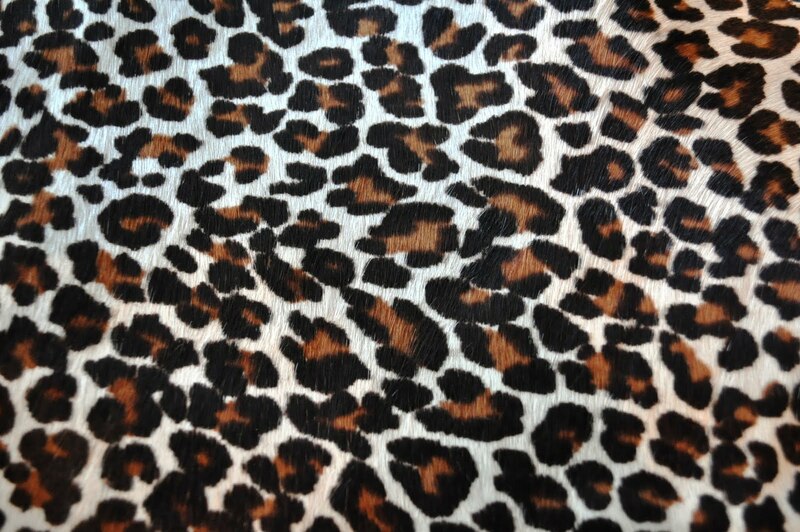 I can’t believe how ‘me’ they are: they’re in leopard print, and they are in my fave colours teal, purple, black and pink. 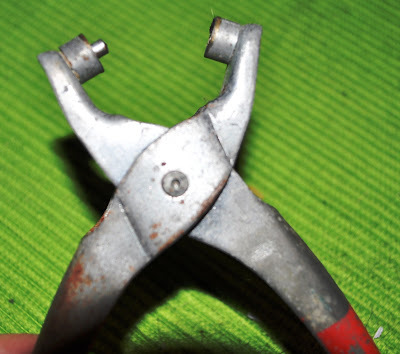 Oh, and they’re squarish, which I like – I’ve never liked those pointy ones. Violet has an awesome blog which showcases her hime or princess style – she can sweeten or deco anything! 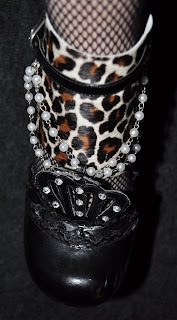 I am constantly amazed at the amount of DIY projects she does…and the depth of detail you get! It takes a lot of time to get the right pictures, document the steps etc, and she just aces it and makes it look easy. I also love the humour and sweetness with which she does things: see one of my faves, her day out in Singapore with fellow fab stylish Nuffnang blogger Candice aka Super Kawaii Mama (the vid is a collaboration of the two). SKM also has an amazing and very popular blog, with an added vintage slant. Oh what the heck, have a look! And please head to both blogs for many more fab videos. Candice and Violet’s Day Out! from super kawaii mama on Vimeo. 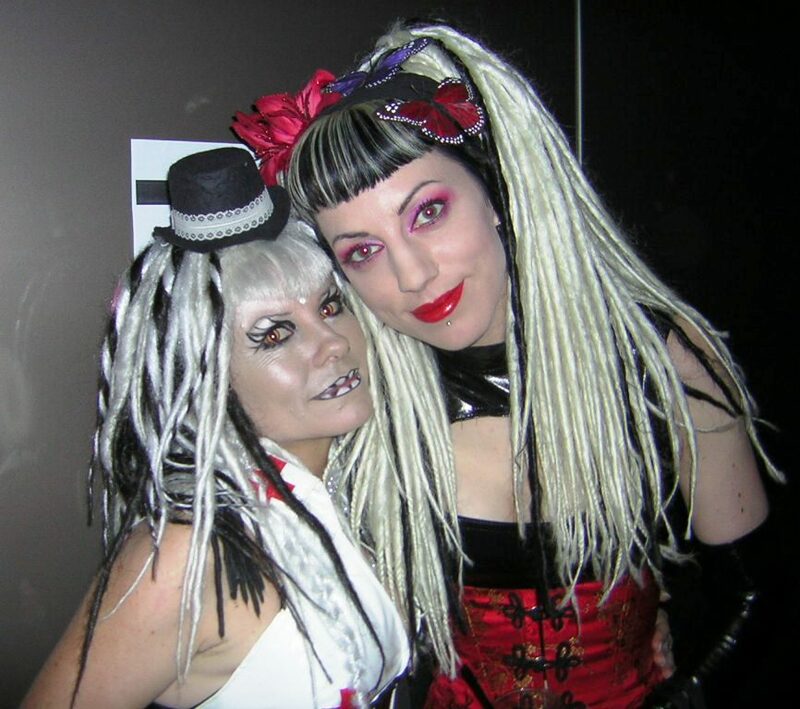 Violet is also lovely in person, and so I’m excited to catch up with her again, if ever so briefly, in Melbourne. I’m heading there on Friday predominantly for the Tim Burton exhibition, but also attending the Amazing Bodies exhibition, the goth club Heresy at Blue Velvet, and possibly the punk gig Top of the Trashpile. Sunday will be brunch then plane home. What are you up to this weekend? Have you seen the Tim Burton exhibit when it was in NYC? Or going soon? I often tend to think that you can just look at a picture of someone made up and figure out how it’s done. That’s because I’ve been playing around with make-up for years. 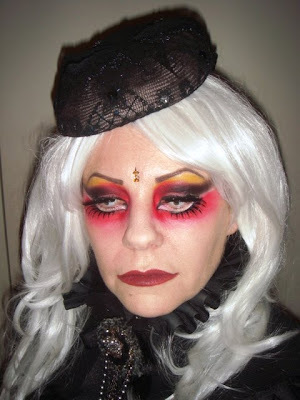 But then I hear from people who don’t wear make-up very much, or aren’t very adventurous, who are overwhelmed by the look of over-the-top make-up and want step-by-step tutorials. Well, here is my how-to from Saturday night. Obviously it’s quite “out there” so you’ll want to wear it to a fancy dress party, alternative club or halloween. 1. Start with cleansed moisturised skin. 2. Apply concealer and foundation. 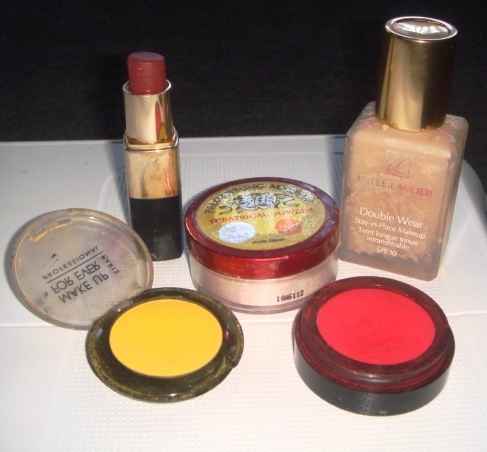 I used Estee Lauder Double Wear base and concealer, although I have often used BB cream as a primer first. 3. Draw a new fake eyelash line below your eyes – 1/4 to 1/2 cm below (pencil or liquid eyeliner is fine; use whatever you feel most comfortable with, but the line must be fine). The idea here is to unnaturally enlarge your eyes. 4. 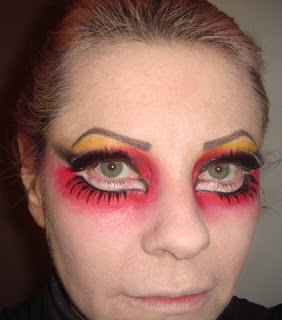 Take your red eyeshadow (I used Manic Panic in ‘Vampire Red’) and shade the inner corner of your eye, and underneath the new lash line you’ve just drawn. Blend down towards the cheek and out towards the temple area. Also blend the area near the nose, so there’s no harsh lines. 6. From roughly where your iris starts, apply the dark eyeshadow in the crease, and wing it out towards the temple. I used Mac shadow in ‘Beauty Marked’, which is a soft black/red velvet shadow with reddish shimmer – but you could use ‘Black Tied’ or any dark shadow. 7. 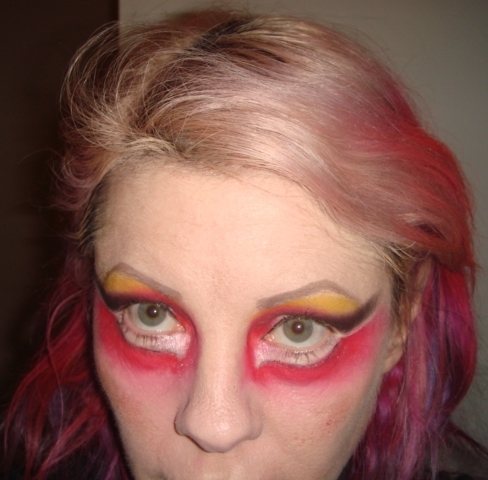 Get a vivid yellow eyeshadow – I used Make Up Forever in ‘Sunflower‘ – and highlight the browbone, just under the brow. 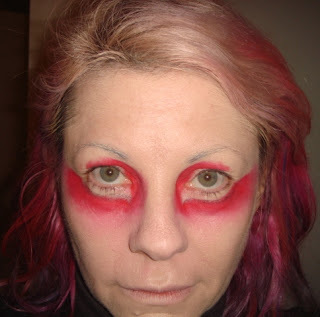 Blend into the red on the inner eye, and the black on the outer. 8. Apply a fine line of black liquid eyeliner along your top lid. Wing it out if you wish. 9. Get a white or cream pearly shadow and underneath your eye, apply it to the section between your eye and the lower line you drew. This is to form the fake new eye – we’re pretending the white of your eye is larger than it is. I also did a fine line at the side of my eye between the red and the black. You’re now at this stage. 10. Get a black liquid liner and very carefully draw over your lower fake lash line, all the way to your inner eye at the tear duct. Join with eyeliner on upper eye that you drew before. 11. Apply your lower lashes – this is now quite simple as the line is already drawn, and then your upper lashes. I used normal upper lashes for my lower ones, but I used them upside down, so they curl outward the way real lashes do on the bottom. However, you can buy lashes specifically for the bottom. 12. Assess the overall look at this stage. 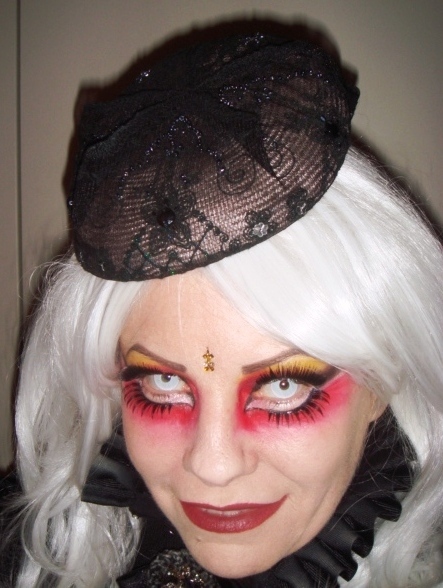 I decided to darken the brows given that my false lashes are quite thick and dark. You may want to put white mascara over your natural lower lashes too, if they are dark, but alas, mine are very sparse and almost invisible. 13. Time to powder your face. I’ve been using Palgantong Theatrical Powder from Japan that’s nice and pale, in Light Beige (it’s made in Korea). 14. Line your lips and fill in with lipstick of your choice. I prefer plums to bright reds and used ‘Grape’ from David Jones. You could do pointy lips on the top for a more evil look, but I just wanted to focus attention on the eyes. 15. If you want to wear contact lenses, wash your hands thoroughly and insert the lenses now. I personally need them for distance so can’t put them in before doing the make-up, but it’s up to you, especially if you wear special effect lenses with no prescription. 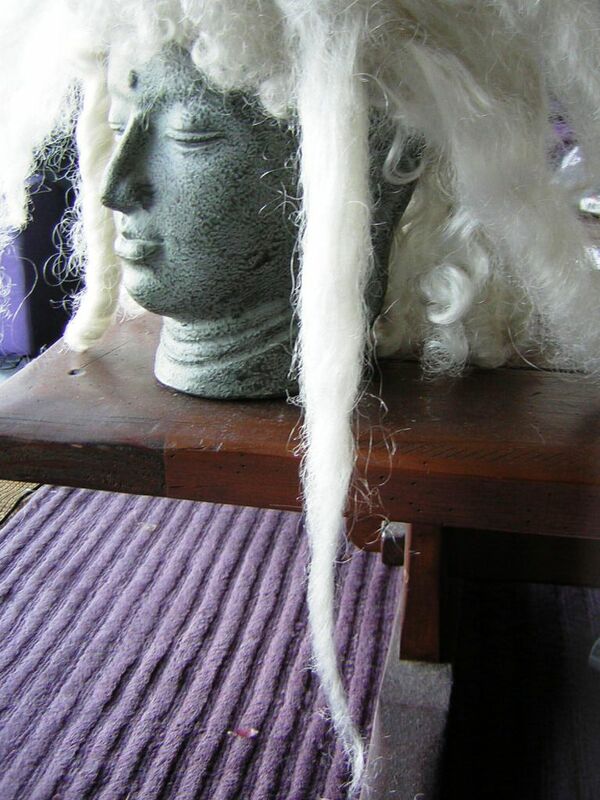 Finally, to get the best theatrical look, grab a wig in the colour of your choice, and why not don a hat while you’re there? 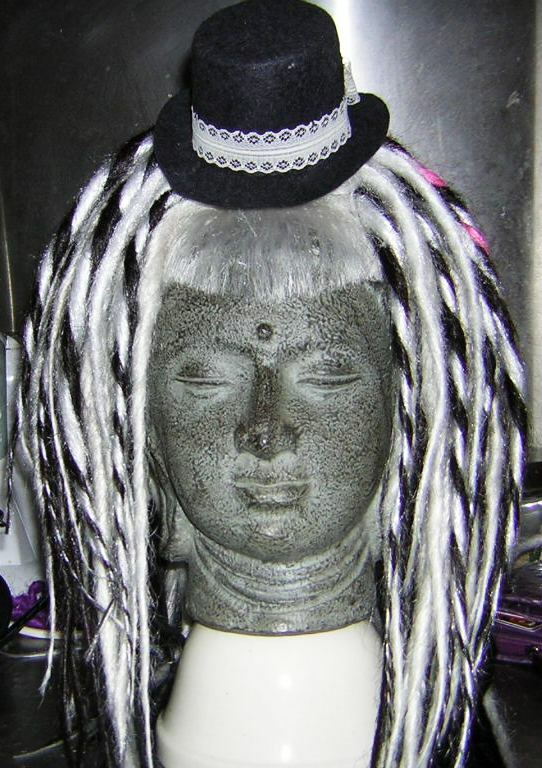 Or even a bindi as I have done, for an exotic look. Ta-daaa!! The finished look. 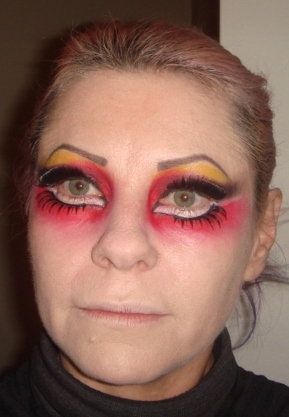 OK, I could have blended a little better in parts (it looked more blended in real life), but it achieved the spooky halloween look I was after. With more time, I would add sparkly diamante stickers below my eyes too for extra zing. Anyway, I encourage you to try something similar sometime…maybe October 31st even.